To help you stay dry on the lighter days of your period or at any time, choose the discreet protection of Always thin pantiliners. These pantiliners can offer handy additional protection when you're using a tampon. They can also be an effective solution when you don't need the full coverage of a maxi pad. There are different lengths, shapes and absorbencies, as well as pantiliners with wings that help them stay in place. Always maxi pads and thin pantiliners here at Walgreens.com can help you stay secure, dry and fresh. 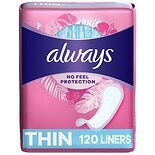 Thin pantiliners from Always are available with or without added scents and have strong adhesive so they stay in place. Always flexi-style thin pantiliners have edges that fold to fit multiple styles of undergarments for ultimate convenience. Some Always pantiliners are even dermatologically tested for worry-free comfort. 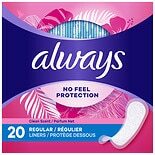 In addition to Always thin pantiliners, you'll find a broad selection of feminine care products including Always maxi pads and more. Always Infinity pads offer thin, reliable protection. Always ultra thin pads come in a variety of shapes, lengths and absorbencies. 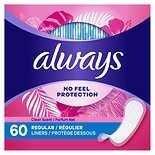 Always even makes feminine wipes that are flushable for easy disposal and come in individually wrapped packages for convenient use anytime, anywhere. Browse all of our feminine care products here at Walgreens.com. Find maxi pads and tampons to help you get through your period. There are feminine hygiene washes and feminine cleansing cloths. We even have PMS relief products, as well as heating pads and other pain relievers to help with cramps. You'll also find feminine health products such as yeast infection treatments and vaginal antifungals.